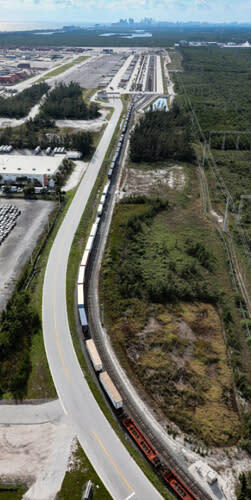 The 43-acre near-dock Intermodal Container Transfer Facility (ICTF) at Port Everglades is operated by Florida East Coast Railway (FECR). The ICTF&apos;s advantageous location adjacent to the Port&apos;s docks allows international containers to be quickly transferred between ship and rail. The facility also handles domestic containers originating in or destined for the Eastern United States market. The ICTF reduces congestion on interstate highways and local roadways. It reduces harmful air emissions by diverting an estimated 180,000 trucks from the roads by the year 2029.